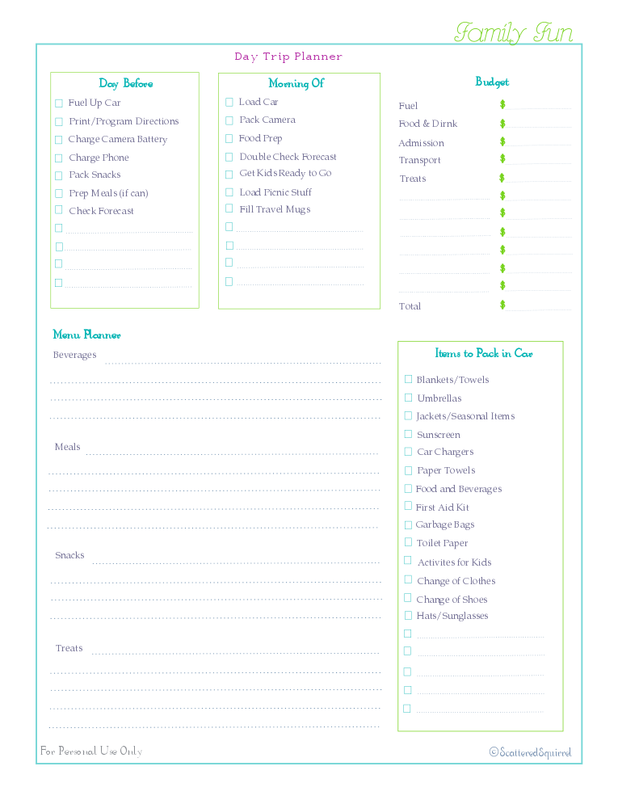 Scattered Squirrel: Planning Those Day Trips and a Free Printable for you!!! Planning Those Day Trips and a Free Printable for you!!! Always something on the go. Well, another set of days off have come and gone. Travis got home Monday night, and left again Wednesday morning. This is only the second time he's been home, and already we're getting weary of it. One day is not enough to cram everything into. I'm eager to move and be settled, ah, but first our house must sell. We hit a couple snafus with the listing, but they're fixed now, for the most part. We just need to get people in and get someone to make an offer. I'm ready to go. All I need is a bunch more boxes and I can have the house packed and ready to go in a week if I need to. (Can you tell I'm eager to go?) While we continue to play the waiting game, I'm working at getting myself more organized. This is serving a few purposes; first, I LOVE to organize! It's not just a necessity, it's a passion, it's stress relief, it's FUN! Secondly, it's keeping me busy, giving me a focus for the restlessness I'm feeling. It also means I get to have fun playing around on the computer creating printables, which is something I absolutely LOVE to do. And lastly, it means that I don't have to worry about this after we move, which means I can focus more on catching up on family time! As I mentioned last week, (here) I'm revamping my Home Management System. As with most organizational systems it takes a little time, and some tweaking to get the one that is just right for you. As family or home needs change, you need to reevaluate your systems and change them accordingly. I've opted to start this process with the addition of a new section to my HMB called the Family Fun section. Last week I shared the first part of that section with the Activities Directory. I also mentioned that our family loves to take day trips. Get out of town, discover something new, revisit a place we found and loved, the reasons go on and on and on. With our new home town's location being so close to so many wonderful things, I can't wait to get out there and start discovering. Day trips are wonderful, they allow you to have a mini vacation, even if it's just for the day. You can forget your worries, your stress, leave it all behind and get away for a few hours. Though day trips for us usually means leaving after breakfast and getting home before bed time, they still take a little planning. After winging it for a long time, making up lists on random pieces of paper, I've finally put together a Day Trip Planner. I've created a check list for the items that we like to have on hand, to do lists, budget (always important to know what you're going to be spending, otherwise you could spend a lot in a day) and a menu planner,(because you can save a ton of money if you pack a picnic and your own snacks) and the best part of all, is I was able to get them all onto one page, so now I have one place to keep track of it all, instead of a bunch of lists on multiple pieces of paper. With the menu planner, what I will often do is plan out everything I'm making or bringing along first, then at the end of each section I make a note of what we'll purchase while out. It might be something like an ice cream, or slushy, or perhaps we've decided to picnic for lunch but go out for dinner... I make a note of it on the menu planner, then I can work it into the budget. And, as I said last week. While revamping my HMB I'm sharing ALL the printables with you, so as usual, just click the caption to get your copy. Recently I've received a few emails from people who were unable to download some of the printables, I've been looking into the problem, and as yet, have come up with no solutions. However, if you have any troubles, please just send me an email and I'll be happy to send you the file/files you would like. And I apologize for any inconvenience this has caused. Is anyone else working on their Home Management Binders/Systems? Are there any printables that you think you might need or want? Drop me a line and let me know, maybe I can put some together during the next few weeks and pop them up on here for you! I hope you all are having a wonderful day! I'll be back tomorrow with more Family Fun stuff!! Thank you for sharing! I'm trying to get a Home Management Binder going this month, or definitely when I am done teaching at the end of the month and have a free summer. I couldn't preview the doc but it did let me download, if that helps. Hi Heather! You're very welcome. :-) Thanks for letting me know about the preview problem. I've been having the same issue, but I thought it was just because it was on my account, I'm going to look into that and see about getting it fixed. Nothing like not being able to see what you're downloading! Oh that's so true about systems having to change. A few years ago I had a nearly perfect system and it just worked so well that I was expecting to get right back on that "train". This time it just puttered to a stop and never regained momentum. This time I'm having to use an entirely different approach. Thanks so much for taking the time to leave a comment! It means so much to me! Slightly distracted, mildly frazzled, always crazy busy with something, (even when I'm doing nothing) and loving the adventure of marriage and motherhood!